The Applicant Consent to Release Information template is a letter to be signed by the applicant to allow information to be released to your company regarding the applicant. This form is useful for helping gather information about an applicant's previous employment and education. This Applicant Consent to Release Information is included in editable Word format that can be customized in Word or by using the included Wizard software. Instructions: In order to consider an application for employment with Company Name, each applicant must authorize Company Name to make inquiries. This consent form allows Company Name to gather the required information from the parties listed during the application process. You must be at least 18 years of age to agree to this consent form. If you are not at least 18 years of age, you must additionally get a parent or guardian to sign this form in the space provided below. I, First Last, authorize Company Name to inquire and request information about my educational qualifications and past employers. I also understand that the results of these inquiries shall be made available to Company Name and become part of my permanent record with Company Name. I hereby authorize any Company Name-approved staff or third-party designee to conduct such inquiries and I authorize all past employers, educational institutions, service organizations, volunteer groups, or any other organization or certifying body to release information to Company Name. Insert Social Security Number / TIN / ID. Date when the contact was signed. 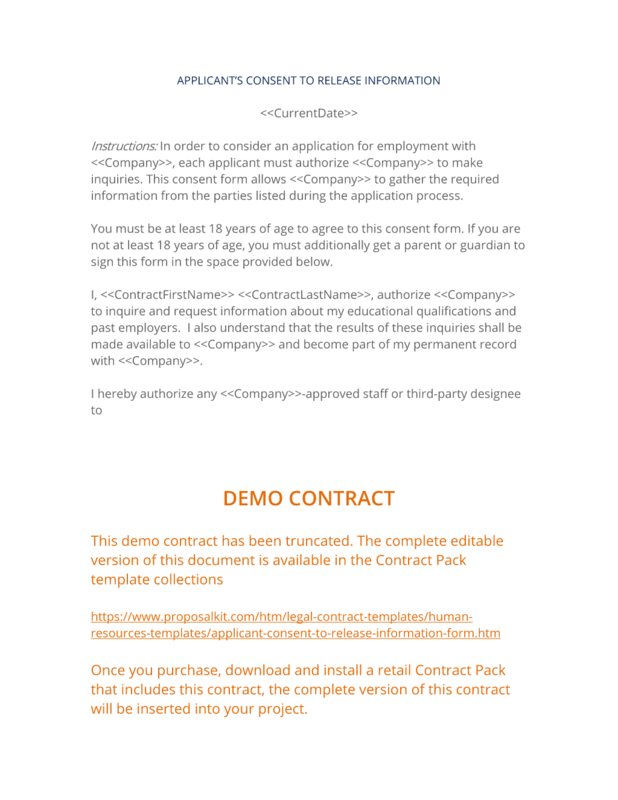 The complete Applicant Consent to Release Information - with the actual formatting and layout - is available in this Contract Pack.